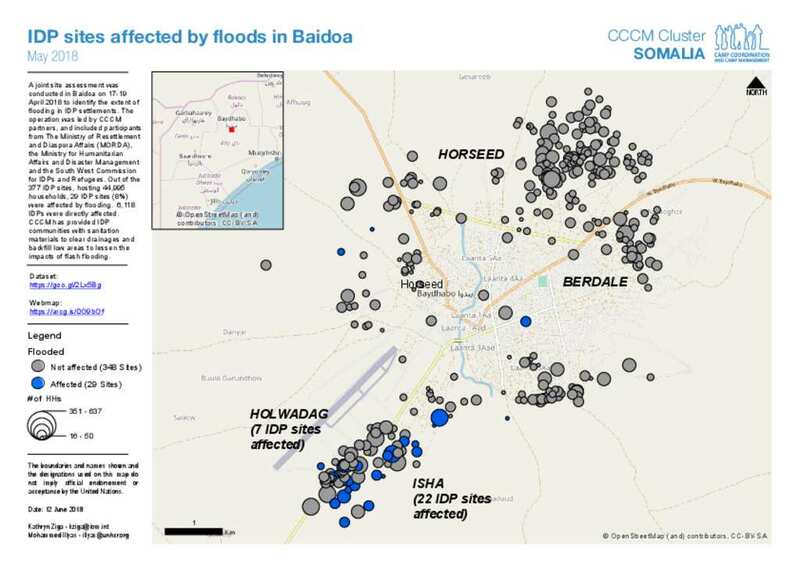 A joint site assessment was conducted in Baidoa on 17-19 April 2018 to identify the extent of flooding in IDP settlements. The operation was led by CCCM partners, and included participants from The Ministry of Resettlement and Diaspora Affairs (MORDA), the Ministry for Humanitarian Affairs and Disaster Management and the South West Commission for IDPs and Refugees. Out of the 377 IDP sites, hosting 44,995 households, 29 IDP sites (8%) were affected by flooding. 6,118 IDPs were directly affected. CCCM has provided IDP communities with sanitation materials to clear drainages and backfill low areas to lessen the impacts of flash flooding.